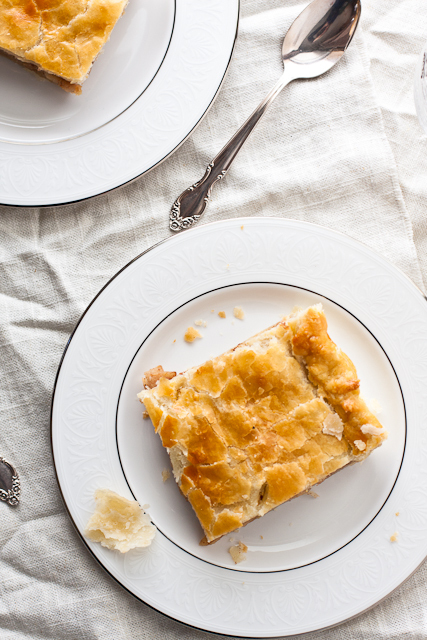 Butter + Apples + Bourbon + Heavy cream = the best 10 pound apple pie you’ll ever sink you teeth into. 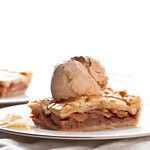 It’s a mash-up of 1) The Pastry Queen’s Southern Comfort Apple Pie, the very best apple pie I’ve ever eaten and 2) Tara’s Slab Apple Pie, the most beautiful apple pie I’ve ever seen. And I’ve made it 3 times in the last 3 weeks. 3. Times. That’s 30 lbs of apple pie! Did you click the link to look at Tara’s version? No? I’ll wait. Because sweet flaky, buttery baby Jesus. The homemade pie crust is incredibly buttery and flaky and the apples inside are lightly coated with a cinnamony (it’s a word) bourbon caramel sauce. If you’re doing the math at home, that’s 5 sticks of butter. And it’s so totally worth every single bite. Sweet apples are served family-style in a bourbon-caramel sauce, underneath a buttery, flaky homemade pie crust. Add the cubed butter (I cut the sticks into quarters lengthwise and then make 10-12 cuts for small cubes) to the bowl, toss to coat, and then cut the butter into the flour until the butter cubes are about the size of small peas. You can use a pastry cutter or two knives. I use my fingers - it's a workout! Add 1 cup of the cold water and stir with a spoon at first, and then use your hands to fold the dough a few times to create one large ball - add the additional water if necessary to bring it all together. Divide the dough into two pieces - I weighed the ball and pulled 2/3 off for the bottom crust, leaving the remaining 1/3 for the top crust. Wrap in plastic wrap and refrigerate until ready to use. To make the filling, melt the butter over medium heat in a large pot (you'll be adding the apples to the pot - I use my big "pasta pot"). Stir in the sugar, salt, and cinnamon. Let the mixture come to a slow steady boil and cook for ~10 minutes. Add the whiskey and cook for another ~10 minutes. Remove from heat and stir in the vanilla and heavy cream. While the mixture is cooking, line a 11x17 jelly roll pan with parchment (or just butter it). Flour your work surface and roll the bottom crust to a rectangle larger a few inches larger than then pan. Transfer it to the pan, making sure it is big enough to hang over the edges, and then put it back into the fridge. Roll out the top crust to about the same size of the pan. Put the apples in the still warm caramel sauce, stirring until all of the apples are coated. Pour the apples into the prepared pan, spreading out into an even layer. Top with the other crust, fold the excess crust over the top crust, and then crimp the edges. Take a knife and cut several small venting slits over the top of the pie and brush with the egg wash.
Bake in the top of the oven (with a large pan or foil on the shelf below - you will get spatters and drips) for ~45 minutes, until the crust is golden brown. Take out, let stand for ~15 minutes, and then enjoy with an optional (just do it) scoop of Salted Caramel Gelato on top. Gawwgeous! 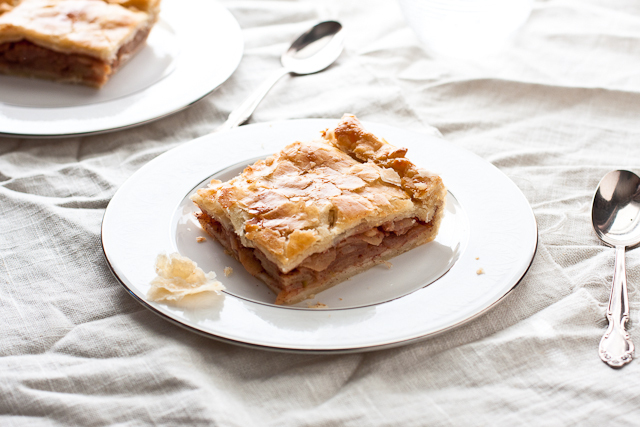 I really need to get on making the Southern Comfort Apple Pie since you and Josie have been raving about it for years but now maybe I’ll just make this version to merge that one with the 10-lber slab pie. And how about this crust? Pretty damn amazing, isn’t it? 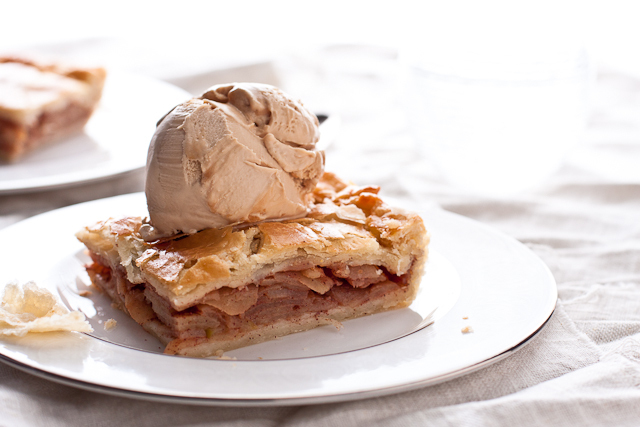 Also IMHO, ice cream isn’t optional for a pie like this – you done right with the salted caramel gelato on top!! Yes, I daresay this is a perfect pie! And cinnamony is TOTALLY a word. Hellloooo, beautiful. I want a BIG slab of this beauty! Happy Holidays / Merry Christmas! Oh My God!!! This looks INCREDIBLE! I have to try this over the weekend with my Mom. Thanks for the recipe. My mouth is watering just looking at this deliciousness. I may have to shock my whole family at our Christmas get together and bake this. My mom is usually the one who does the apple pie, but her’s is open faced and not similar to this other than it has apples and crust. So it’s totally okay for me to bring this… amiright? Thanks for the pounds! looks delicious. can this be baked in a regular round deep dish pan?